Photoessay by Jill Quirk. Protest 6.45 am; Location: Beaumaris Secondary School, Reserve Road, Between Gramatan Avenue and Balcombe Road, Beaumaris. Wear red to show anger. Today I took photographs of the scene at Beaumaris Secondary College where 229 trees are scheduled for the chop tomorrow morning at 6.45 a.m. The area is fenced off as a demolition and building site. It looked to me as though a lot of vegetation if not trees has already been cleared and as though a couple of exhibits will be left in isolation for aesthetic purposes as solitary reminders of nature. I’m sorry for the displaced wildlife, especially possums who will no doubt find their way into the gardens of unwelcoming residents. 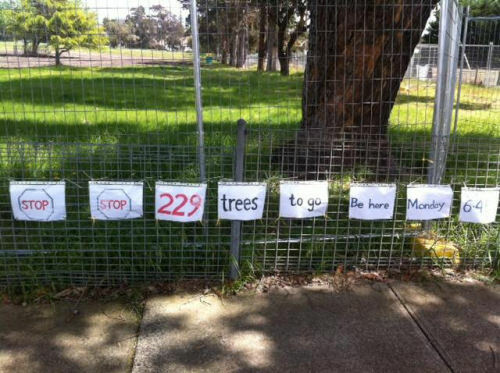 One of the notices on the fence said that they want a new school but retaining as many trees as possible. Who is the new school for ? Current residents or for a large expected influx from overseas? 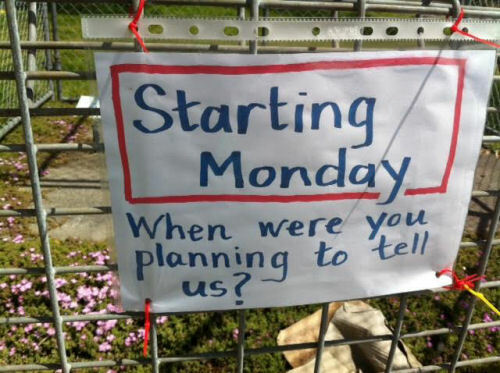 I have just heard on 3AW that following a 200 strong protest there has been a "victory for people power" and work at the school has been suspended until there is a consultation process with locals. 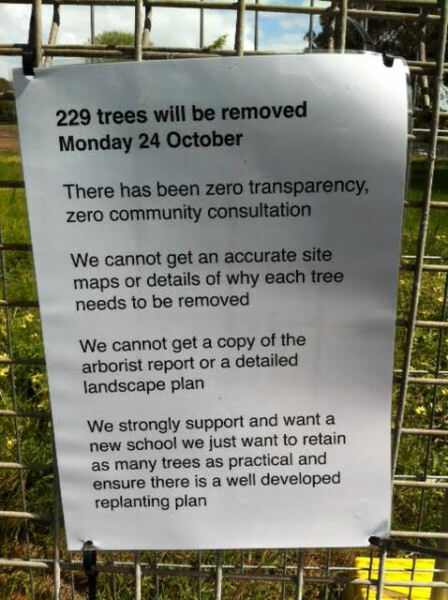 "200 plus trees being removed from Beaumaris school site Monday morning 19th very early. Been kept secret to avoid protesters. Police are organised. “ No time is stated, but EPA noise regulations forbid chainsaw use before 7:00 am. “Please urgently spread the word as widely as possible, as disregarding this alert is just not an option. The consultation process is far, repeat, FAR from complete. 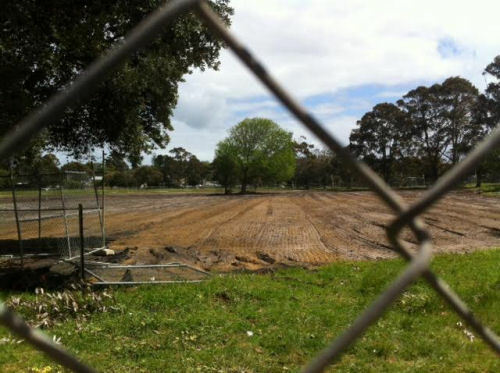 Not a single metre has been offered by the VSBA for retention and replanting of fence line buffers, for a wildlife corridor or as an adequate buffer to Long Hollow Heathland. Agreement after agreement within the 'consultation process' has been dishonoured. Such a further faithless betrayal of trust must not be permitted, and we ask that all concerned in our community mobilise (as in October) to once again prevent unauthorised destruction and to hold the government to its word."